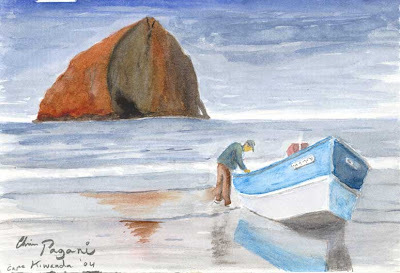 Cape Kiwanda / Pacific City Oregon... the last place in America, maybe the world, where commercial fishing boats in the form of dories are launched directly from the beach, into the surf. A dying breed. Pacific City is being developed like crazy by real estate speculators. This benefits about 5 families in the area but will soon end the unique nature of the town. These paintings are already in private collections but I DO have (for now) some inexpensive posters and framed prints available here: Roadside Oregon Artist Gallery. 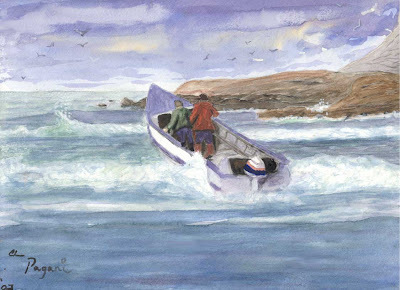 I'm reading: Surf Dory Pacific City WatercolorTweet this!